I find I keep asking this when friends question me about our recent trip to Peru. I hadn’t and milking was one just one of the new and very memorable experiences from our trip. Our plan was to see the Lares area first, on a rather luxurious lodge based trek, then to visit a small scale community tourism project in the Ausangate area. The trek in the Lares area was fabulous, we stayed in beautiful lodges and walked each day. The communities were involved in working at the lodges and supporting the trekking. The next visit to the small scale project was at the other end of the spectrum. We travelled for 3 hours , south of Cusco, to a small settlement called Pukarumi, beneath Ausangate, a towering Andean peak of 6,384 metres. For 3 days we shared the life of Felipe, his wife Juliana and three of their five kids (21, 15, 10), that live at home. Accommodation is very simple, with comfortable beds in twin rooms, a drop toilet and outdoor communal wash area. A dining room, toilets and hot showers are planned. The family live on the land and farm much as they have for centuries. They sell milk and alpaca wool and have some income from Felipe’s work as an arriero and cook for trekkers – which is how I know him, from my first trek there 20 years ago. The milking was a challenge and more difficult than I expected. Lewis, my ten year old son, had more success than I did and effortlessly pulled a bucket full of frothy warm milk. We heated up the milk with suero (whey) to make fresh white cheese which we ate on oatcakes we had taken from Scotland to share. Delicious. We followed milking and cheese making with digging potatoes – Andean varieties – qonpes, yana maqtillo, peruanita and huayro. Lewis, usually a reluctant gardener, for some reason loved this. We dug up beautiful multi-coloured tubers, a bit premature, but big enough to eat. We cooked them underground on hot stones in a traditional pachamanca with alpaca meat, seasoned with a local herb, huacatay (Peruvian black mint). Next was a visit to a nearby guinea pig farm, where an enterprising neighbour had invested the dollars earned working in the mines, into a small scale production plant. 300 guinea-pigs run in pens, breeding every 3 months. Guinea pigs are mostly eaten oven roasted on special occasions – one each. We then stopped by a small scale cheese production plant, run by another neighbour. Several hundred litres of milk are collected from nearby farmers each day, heated and poured into moulds to make into cheese, that is then taken to Cusco market to sell. It is laborious, and the ladies were complaining about the need to be there all day every day and working out if they could afford to hire helpers. Other days we walked, over the hill to the hot springs at Tinqui, or into the glaciated valleys beneath the towering ice-covered sacred peak of Ausangate. We spent one afternoon watching, fascinated, as Juliana showed us how to weave. My son played football with the local kids and ran around outdoors with the local kids and Carlitos, Felipe’s little dog. He loved being there. Felipe talked a lot about how the way life is changing in what has always been a very traditional part of southern Peru. The next generation has different values, don’t venerate nature and the mountains and are losing the traditions of weaving and knitting. Motorbikes are used to get around instead of horses, many young folk leave their homes to work in mines or the cities and just about everyone has a smart phone. Felipe loves his life on the land and wants to increase tourism in the area, not just for his family. He is introducing the idea to his village, with mixed reception. There is a looming threat to his family and all the communities his side of the Ausangate range from a mining company trying to gain access to the area. Some of his neighbours like the idea of the work this could bring but many fear they would lose their land and their homes. Felipe explained that there is no paper work to prove land ownership, as land is handed down over generations. This makes it easy for mining companies to move in and take over, leaving the people dispossessed and with little choice of where to go. 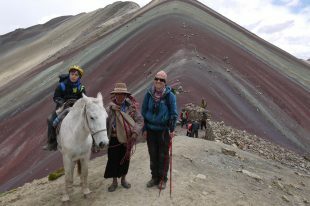 A couple of nights here before the Ausangate circuit trek gives a fabulous insight into Andean life. Felipe’s family could not be more welcoming. Contact our office to find out about the options: 3 to 8 day programmes with trekking (or not) available.